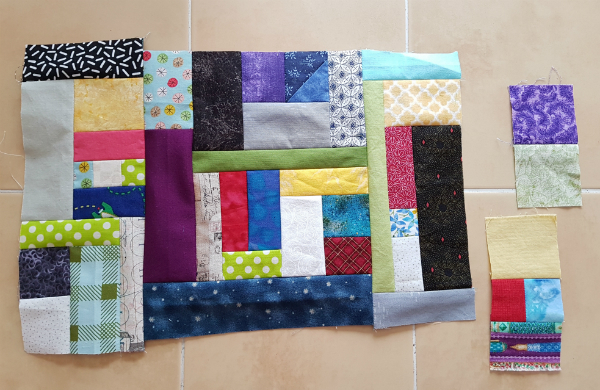 I have always loved scrap quilts. I also love looking at other people's improv quilts, but I've never made one of my own. 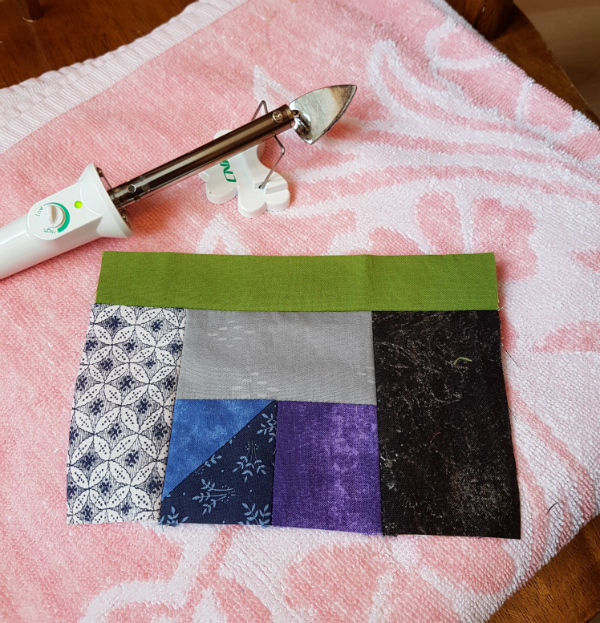 The thought of making a quilt without using my precious rotary cutter? Scary! I've been trying for years to tame my scraps, with limited success. I've had bouts of keeping up with cutting all my scraps into useable pieces as I go, but they don't usually last long. Trimming a quilt, especially, would make me abandon my plans to cut as I go. 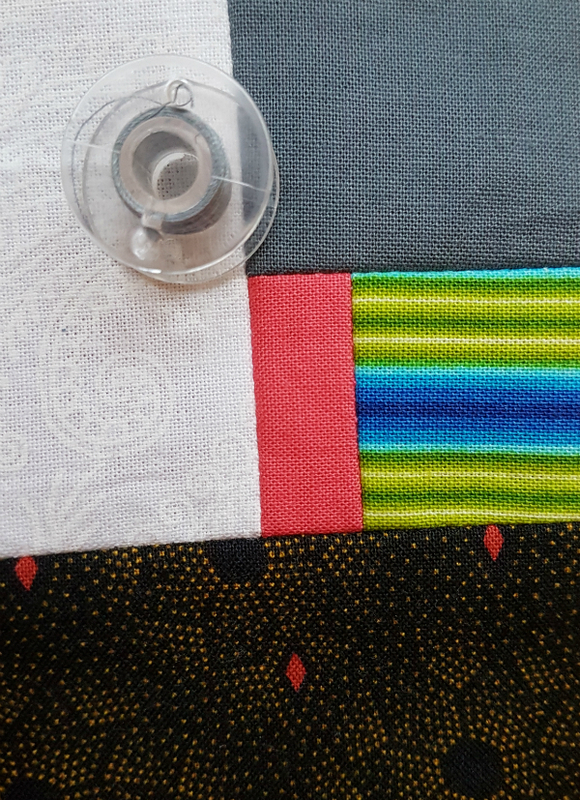 Who wants to cut up those long, long pieces from the leftover backing when they could be getting right to the binding and finishing of the quilt? 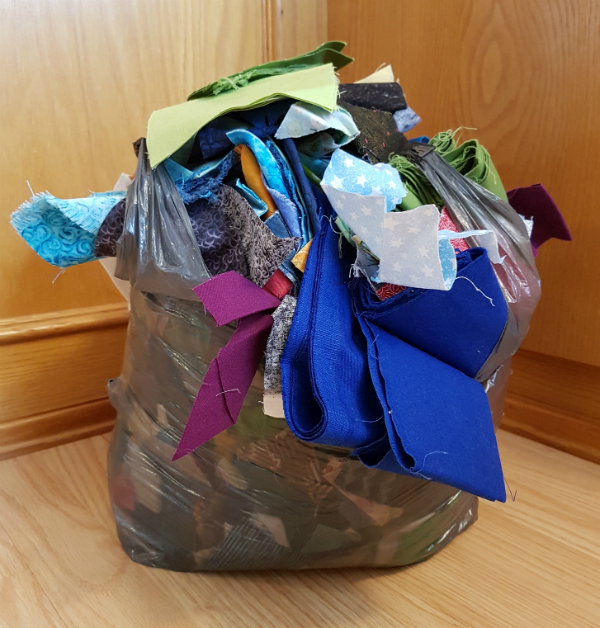 Wouldn't you be inspired to make a scrap quilt if you had that lot of wrinkled, smashed together, who knows what's in there? Yeah, me neither, which is why I just kept shoving more pieces in and rarely taking any out. Until now! 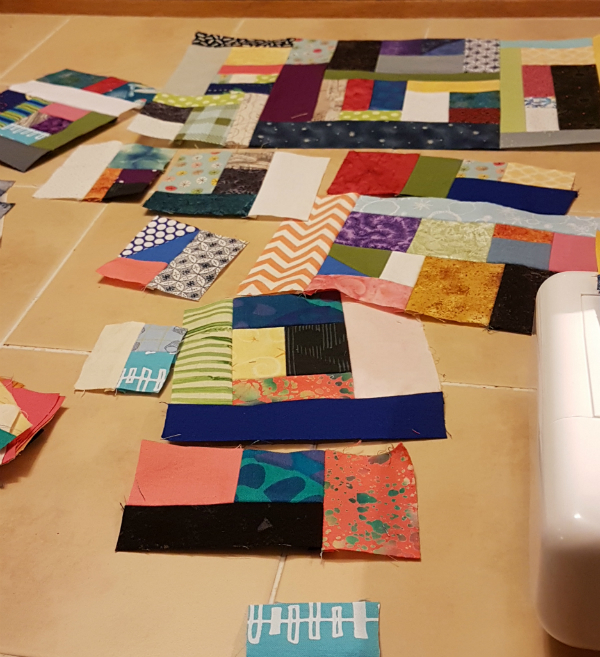 I knew that making the scrappy improv pieces for this quilt would probably take a while. I also know that I'm going to have plenty of deadlines this year, so I didn't want to leave it to the last minute and stress myself out. So one morning, while the kids I babysit played, I pulled out the iron and started taking fabric out of the bag and flattening it back out. Then came the fun of sewing them. I'm going for the everything-but-the-kitchen-sink look. Every colour and every style of fabric is welcome in this quilt. The resulting pieces are wild and crazy! I'm using my Clover mini iron so I don't have to go to the ironing board after every (tiny) seam. It works like a charm. When a friend saw what I was working on, he said, "Now that looks like an old-time quilt right there" and it really does. It makes me think of the crazy quilts of the past and the quilter's philosophy of using every little piece of fabric. This is my smallest scrap sewn in so far. The seam allowances actually overlap on the back! I'm using another fancy-pants storage system to keep the cut pieces corralled. It's not Pinterest-worthy, but it works. 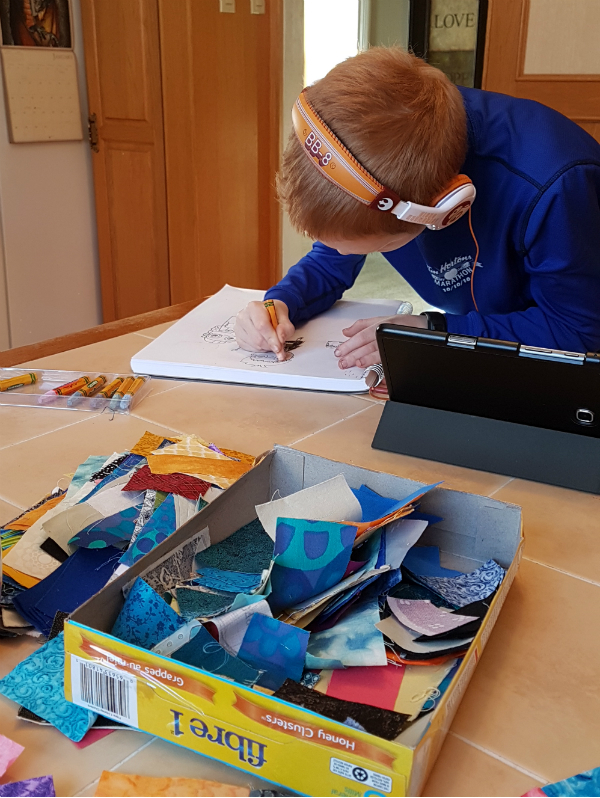 I have two cardboard boxes - one box for the medium sized pieces and strips and a cereal box for the smallest pieces, because they kept getting buried in the bigger box. This picture was taken before I moved the smallest pieces into the cereal box. 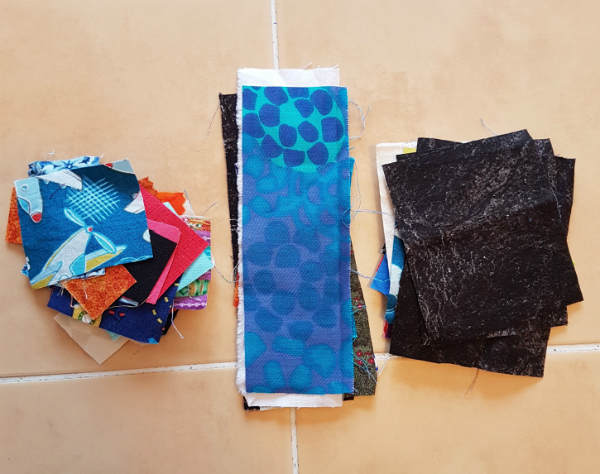 It's no surprise that my scraps are heavy on the blue! I'm trying hard to mix it up and have lots of other colour in there. It's fun to revisit all of these fabrics. It's also satisfying to change them from a wrinkled mess into something useable. I keep thinking of other ways I want to use this technique when this quilt is finished, which is a good sign. 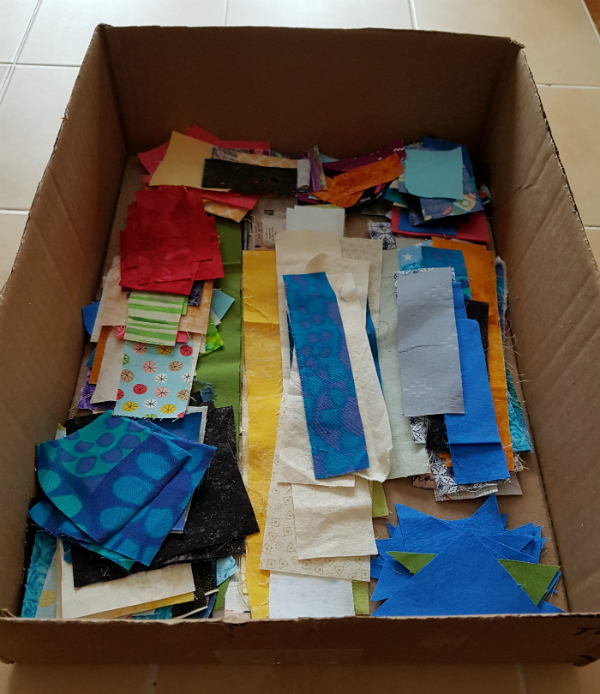 Maybe someday I'll be able to keep up with the scraps! What are your thoughts on improv? Do you embrace it or does it make you nervous? And how small is too small for you when it comes to scraps? I've always said anything smaller than 1 1/2" square was too small, but this process is making me rethink that. Your scrap storage system looks just like mine. I really need to deal with the pile. I'm not a fan of anything smaller than 2.5 inches. Good luck with your project. It looks great so far. I have been struggling with what to do with my huge scrap tote. Now I know what I will do with it! Thank you! love, love, LOVE this Leanne!! It is looking awesome! Do you like that mini Clover iron? I have been wondering if it would be worth picking up to use. I have not had a lot of scrap saving recently, myself, because it was starting to feel overwhelming to not have a good organization method.